*The morning was filled with melancholy as we said goodbye to Archie. Glenn, Archie’s owner, recently returned to Coeur d’Alene and moved into an apartment that takes pets, and so he contacted me earlier in the week, and said he would like to come get Archie on Friday. So Glenn and his friend Matt showed up early this morning, loaded up Archie and his things, and we said goodbye. We enjoyed having Archie around the past three months, and we hope all is well in his new home. *Soon after Archie was on his way, Paul and I were on our way as well. To help celebrate our February “Twelve Dates of Christmas”, we decided a weekend in Nelson, British Columbia was in order. The first time I visited Nelson was back in August of 2013, when Bill, Christy and I took a sibling outing to Nelson. I am glad I get to return. *We headed north through Rathdrum, Spirit Lake, crossed the border in Washington at Newport, and our first stop was in Metaline Falls for lunch at Cathy’s Diner. What a wonderful cafe. Our country needs places like this for people to eat and gather together. I enjoyed a French Dip, and Paul had the Mushroom Swiss burger. Such a charming place. *We were back on the road, heading north to the border crossing between the USA and Canada. We shared our passports, and assured the border patrol we had no firearms in our vehicle, and we were on our way. *As we arrived in Nelson, there was a sign for Observatory Street, where our Airbnb Vacation Rental was located, so we easily found our accommodations at the Observatory Garden Studio. 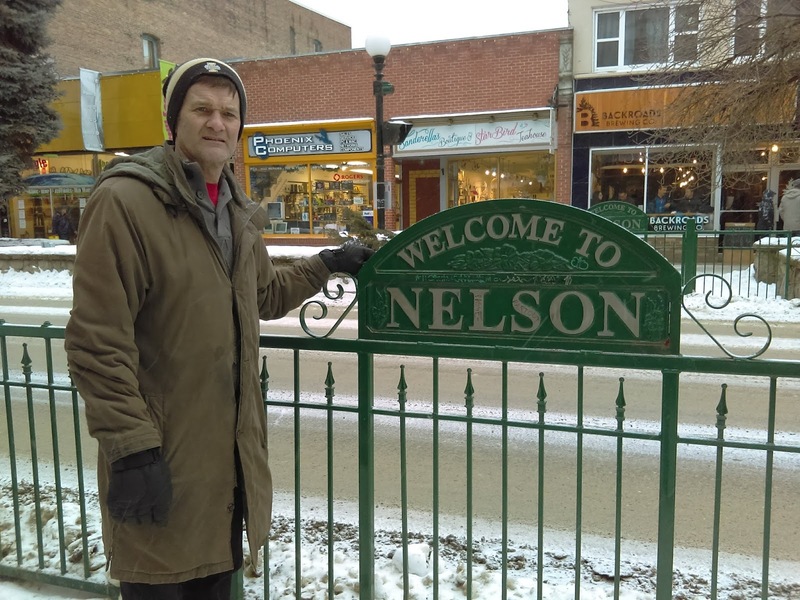 *Downtown Nelson is about five blocks downhill from our rental, so we put our boots, coat, hats and gloves and walked down to Nelson. We strolled up and down Baker Street, and stopped in a book store and browsed. After checking things out, we decided to go buy some wine (you have to go to the liquor store for that), then the nice young man at the liquor store told us about the Kootenay co-op a couple blocks away where we purchased a nice variety of breads, salami, apples and cheeses to take home and enjoy for our evening meal. *It was the perfect choice for dinner. *I am so thankful Paul and I are able to get away together for a few days and enjoy the beauty of Nelson, BC and the beauty of spending time alone together.